Image credit & copyright: Stephane Vetter. Locked away in one of the most remote locations in Iceland, stands the ancient structures of Arctic Henge. The mysterious…..ok, ok no need to yell. So it’s construction began in 1996, it’s still an amazing monument dedicated to the Norse and neo-Pagan heritage of the region. Located in Raufarhofn, this structure really is located in one of the most northern locations in Iceland with the Arctic Circle just offshore. Inspired by the eddic poem, Voluspa (Prophecy of the Seerees), it states that there are 72 dwarfs that represent 72 seasons. When complete, 72 blocks each named for one of the dwarfs, will encircle the five upright structures; one in the center and four outer ones representing the four directions and the midnight sun will interact with the structures at different times of the year. 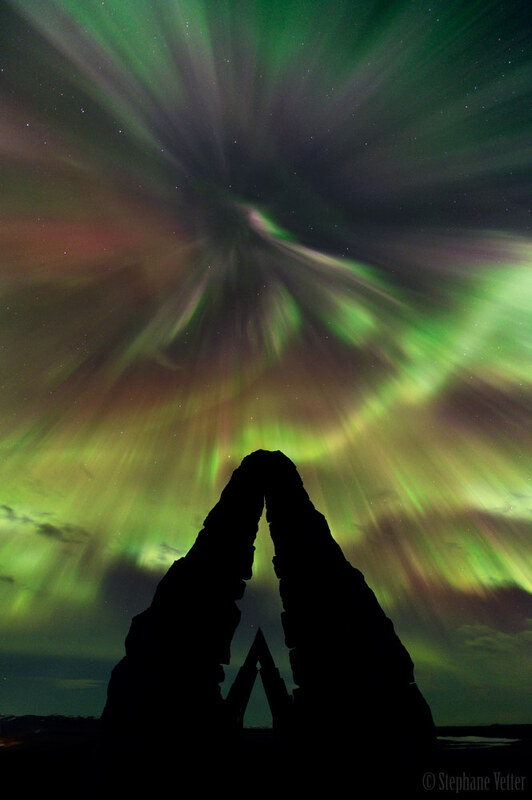 Incredible as that may be, you can also do what Stephane did in this image which is to use the beauty of these spires to capture the natural phenomenon of the Aurora Borealis. Its curtains of color pulsing and waving, sent as a message from the sun to let us know that even though its dark, it is still very much with us. This is a place that if I ever visit, I really hope to find time for. Have a great weekend everyone, and if you enjoy this image check out more of Stephane’s work. Image | This entry was posted in Astronomical Events, Aurora (Borealis & Australis), Images and tagged Arctic Henge, Astronomy, Aurora, Aurora Borealis, DanSpace77, Iceland, Night Sky, Northern Lights, Science, Space, Stephane Vetter. Bookmark the permalink.